Hi, guys! Here comes the 2018 best entry-level full-screen smartphone with stock Android 8.1 and stunning outlook! The latest phone to come from UMIDIGI is the UMIDIGI A1 Pro. You might think it is impossible to get excited about $100 range handsets in the Android space, but clearly that’s not true. The UMIDIGI A1 Pro has a couple tricks up its sleeve that helps it to stand out from the crowd. The UMIDIGI A1 Pro has a massive 5.5” bezel-less screen with 5-inch comfortable grip, enormous 18:9 display taking up 85% of the front surface. UMIDIGI A1 Pro features a glass-like glory back, which is tougher than glass and has more stunning reflections. And it has almost all the cutting-edge features: Face ID, Stock Android 8.1 and Dual 4G LTE! 3GB RAM powered by newest MT6739 assures the high performance. UMIDIGI A1 Pro equipped with popular Type-C, with 5V-2A quick charge the UMIDIGI A1 Pro could be fully charged within 2 hours. On the back of UMIDIGI A1 Pro, you will also find a combination of 13MP + 5MP dual camera setup. As for the finish, UMIDIGI A1 Pro provides 3 options: Moonlight Silver, Icy Blue and Pitch Dark. Presale price will start from $99.99. All specifications of UMIDIGI A1 Pro will be officially released on UMIDIGI website on March 27th. Subscribe for Presale and Win One For Free! UMIDIGI A1 Pro is launching at our official website with a giveaway. 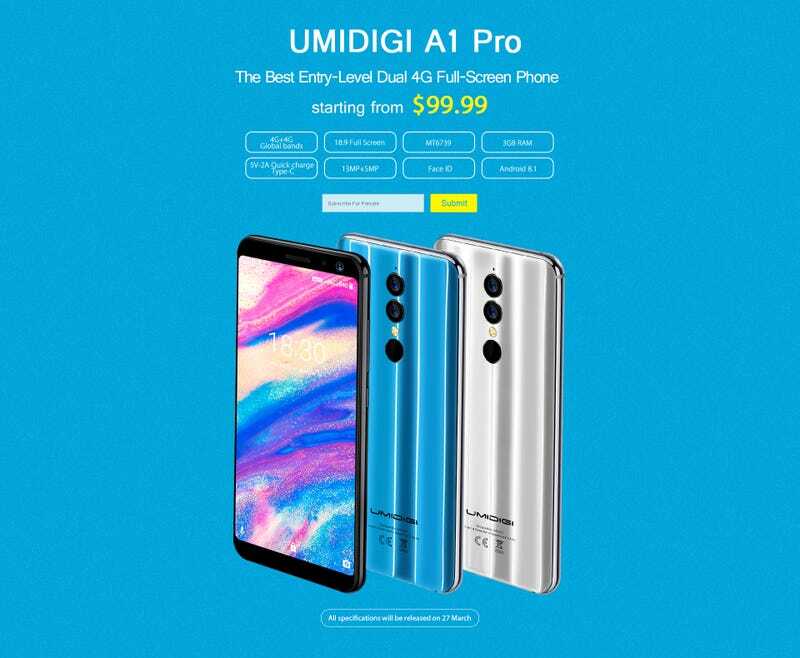 Now subscribe and get a presale UMIDIGI A1 Pro with under $100. Plus, the giveaway start from now until April 10th, take a chance to win one for free!